A family Favorite cold meal during the hot summer months. This Bacon Belly Button Pasta Salad (aka. 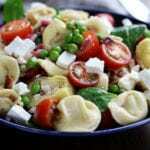 Tortellini Salad) is a zesty and an incredibly delicious pasta dish. Light and yet very satisfying, this always disappears extremely fast! Fry bacon in a large frying pan over medium heat. Place cooked bacon on paper towel to absorb extra oil. Boil water in a large pot. Once boiling add sea salt and then tortellini, boil per package directions. While pasta water is coming to a boil, prepare vinaigrette. Measure olive oil into a very large mixing bowl. Whisk vinegar in slowly to emulsify. Whisk in mustard and crushed garlic. Roughly dice onion and add to oil mixture in addition to drained artichoke hearts. Toss veggies to coat. Cut tomatoes in half, cut bacon into pieces and crumble feta- set aside for last steps. Just before pasta is done, place frozen peas in bottom of colander. Once pasta is done boiling, drain over peas. Once drained, add pasta and peas to vinaigrette/veggie mixture and toss. Let pasta cool for about 5 mins in vinaigrette and then add tomatoes, feta, bacon and spinach, individually tossing after each item.